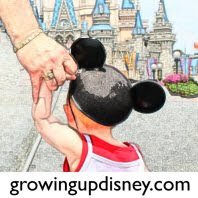 Growing Up Disney: Photo Flashback - Remember My Pal Mickey? In 2003 Disney introduced My Pal Mickey, an interactive plush Mickey Mouse. He would tell you about events and places in the parks as well as play games. Amy purchased one and we took it on a tour of Walt Disney World. We took My Pal Mickey's picture every where we went. Here Amy had MPM and her picture taken at EPCOT with a "statue". My Pal Mickey was discontinued in 2008. I loved MPM. It was so much to have him in the parks. Thanks for the happy memory. I would have loved to have one of these! I bet they were a lot of fun! I agree with Amanda, I would have loved one! What a fun photo! I do remember... my kids loved him! Beth, from what I read MPM was still working in the parks after they stopped selling them in 2008. I don't know if that is still current information. I don't think Amy has taken MPM to the parks in awhile. Pal Mickey is lots of fun. He tells jokes, plays games in or away from the parks, reminds you about parades and show times, and provides random trivia. Chris and I enjoyed taking pictures of Mickey on the referenced trip. I took him back a couple of times. I considered it this last time to see if he would still work but decided we had enough to keep up with, AKA Tink.